What happens when the farm’s all in order and there’s not much to do? What happens when the farmer and his wife say, “Take care of the farm. We’ll be back by two”? What’s a little boy to do…but have fun with all the farm animals…IN THE HOUSE! This hilarious adaptation of “Skip to My Lou” is so much fun to sing with your little one! Skip to My Lou is a board book, which is perfect for toddlers. However, a BIG word of warning; one edition is missing a couple of critical pages. At the end of the story, the animals help the boy clean the farmhouse, and if your edition is missing these pages, the ending doesn’t make sense! This is a book I would recommend reading carefully before you buy it to make sure you have the correct edition. I absolutely love this folk song. I knew it as a song long before I received this book from–who else?–my music teacher mother. Composer Aaron Copeland includes an arrangement of this song, otherwise known as “I Bought Me a Cat”, in his Old American Songs. As is typical of folk songs, the melody and words vary from arrangement to arrangement. It is a cumulative song, adding a new farm animal with each verse. Melissa Sweet writes a sweet adaptation of this song; her illustrations are adorable. When Lily was almost three years old, she was threatening to give up her naps. Emmy was a newborn, and I really, REALLY wanted Lily to keep napping. I would sing “I Bought Me a Cat” as slowly and softly as I could. I added all the farm animals I could think of. It worked every time…Lily would fall asleep while I was singing this song. I haven’t sung it to her in a while, so she has forgotten some of the words. Here she is, singing a couple verses for you. 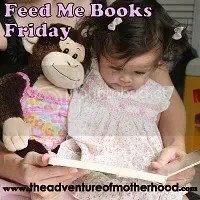 For more books you can sing, visit Janna at The Adventure of Motherhood by clicking on the button below! 12 Responses to More Singing–Fiddle I Fee! I wonder why she wanted to be called "Lily." When my daughter was really small, she carried around a doll she decided to call Anastasia. The doll was the very first thing she named herself. We haven't "sang" either of the books. "Lily" did beautiful job! I should work with B on this one! These look like great books to sing with my kids. Too cute! Thanks. Thanks for sharing these books! I love to find new books – and singing books are lots of fun! I totally forgot about Skip to My Lou but it's one of our favorites, too. The second book looks like a great one too. I love your "Lily" singing the song. Too cute and such an adorable smile. Oh my goodness! She is one adorable squirt! Don't you just sit around all day pinching those cheeks? I don't think I've ever heard of "Fiddle-I-Fee"! Thanks for the introduction. We have Skip To My Lou and it's also one of my oldest's favorite songs. We used to have a video of Fred Penner "Fiddle-I-Fee" and other songs – that the children loved. We'll have to look for the book – and great job to Lily! The books sound good. I love the story about getting her to nap. She is a great job on the video. What precious moments you are making. I also always sang The Old Woman Who Swallowed a Fly book to them! I still like that actually. Well done Lily! I finally understood the words.